Bidders rest on one of the lots at Clarke. New York City is almost cursed with a number of big name auction houses. Christie's, Sotheby's, Doyle . . . where's the fun of going to an auction if you have to worry about wearing the right designer shoes? 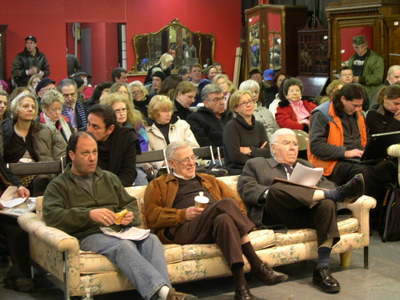 Luckily, there are still some "real world" auction houses in the area. Clarke Auction Gallery is one of these. Comfortable and unassuming, patronized by dealers looking for inventory, interior designers shopping for clients, and apartment self-decorators fleeing Pottery Barn, Clarke has some great finds.